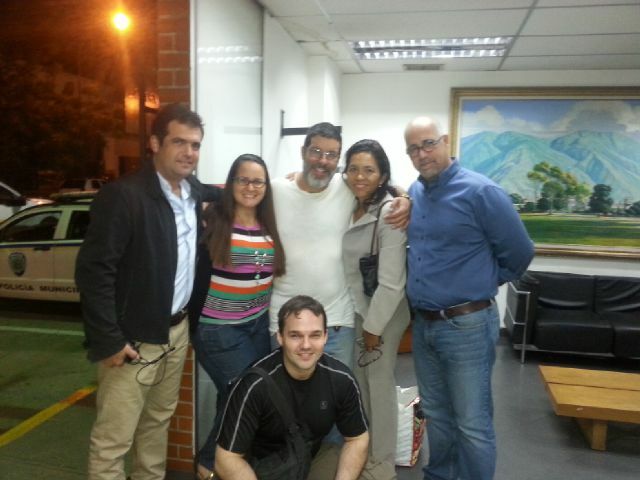 Lawyer Marcelo Crovato (center), with his legal team after his release from Yare III prison. He’s now on house arrest. After ten months behind bars, laywer Marcelo Crovato was released yesterday from the notoriously violent Yare III Prison. He’s been put under house arrest by the order of a local court. Crovato was arrested back in April while defending Chacao residents whose houses were raided by the authorities. His personal situation worsened as his trial was delayed. He could hardly cope with conditions at Yare, and attempted to end his own life last December. Later he protested. He was on the third day of a hunger strike when the court decided to change his reclusion site. His case was taken up by Amnesty International, which called for his release noting there’s no solid evidence against him. The government’s case rested on the testimony of an anonymous informant (which the central government calls a “cooperant patriot”, a controversial term considered by human rights groups as excuse for undercover agents). After months of uncertainty and despair, Mr. Crovato is at last back home with his family. But his ordeal with the Red Justice system is far from over. As A.I. reported in its 2014-15 report: “The justice system was subject to government interference, especially in cases involving government critics or those who were perceived to act in a way contrary to the authorities’ interests.” The only thing we can say for sure is that the State will continue to cynically shrug off all criticism against it.